Apple is late to the music streaming game. In what could be seen as a rare sign of Apple ignoring a product for too long, Jimmy Iovine and company are still putting the finishing touches on their shift from paid downloads to paid music streaming. While Apple will most likely have a specific marketing plan in place to become the biggest paid music streaming service in the world, the overall risk to the strategy remains elevated. Being forced into something is a new experience for Apple and one has to wonder if becoming the most popular paid music streaming service is just a near-term prerequisite for a company with much bigger music initiatives. The sea change in music continues unabated. Paid music sales are declining as music streaming is growing in popularity, built primarily on a freemium model where advertisements are used to annoy listeners to the point of driving paid upgrades. Spotify has 15 million paid members, equivalent to less than 5% of the overall iPhone user base, while YouTube serves billions of songs, masked as videos, for free. In such a volatile landscape, Apple's rumored plans for music streaming seems rather simple and, to a certain degree, refreshing. One tier, charged at a monthly rate, with users able to listen to music across a range of products and even operating systems. Apple's strategy with music streaming continues to be a work in progress, but from what we know, curation and discovery will be two main tenets of a service that uses music exclusives as a carrot to entice users. In what could be a major negative, Jimmy Iovine reportedly was unable to get the cost for this music streaming service down to $5/month, with record labels demanding Apple remain steady at the "me-too" $9.99/month price. The primary problem with this chain of events is that music executives are hardly in a position to be dictating pricing and business strategy in an industry that may be fundamentally broken, yet again, by technology. One theme that permeates this discussion is Apple's forced hand. With iTunes Radio, a seemingly "me-too" product compared to Pandora, Apple has seen moderate levels of success, but nothing that would jump out to an observer as ground-breaking. Apple risks a very similar fate with a paid music streaming service: garnering enough success to warrant respect with the endeavor (mostly because the bar is set so low), yet unable to capture the music industry like it was 2005 again. In essence, Apple would be stuck in catch-up mode. At $9.99/month, Apple will still likely be able to sign up millions of iOS users (and a few Android users) to its music streaming service. However, the elephant in the room would remain untouched: YouTube. What are the longer-term implications if Apple is unable to fundamentally change the music industry with its paid streaming offering? Is additional M&A for streaming mindshare the answer? Using less than 0.1% of Apple's cash to force extra long music exclusives? Does any of this resemble the "Apple way" of putting the product first? I continue to see Apple wanting to get to a point that takes some of what Jay Z described (and which has been talked about for years by others, including at Above Avalon) and then build a viable and sustainable business model around it. 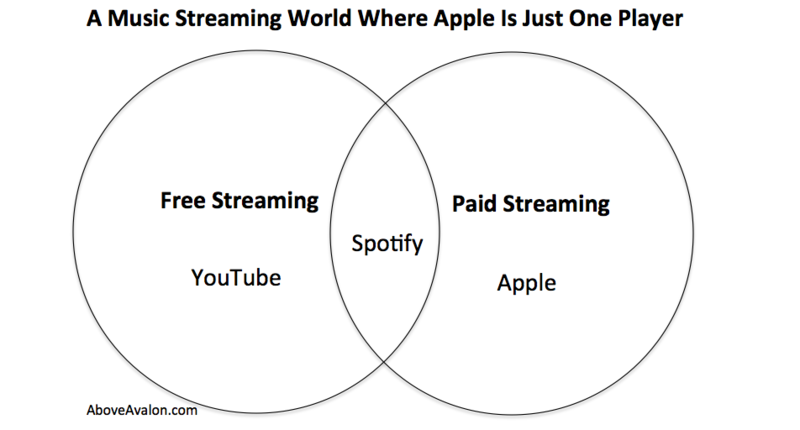 Such a place may very well include paid and free streaming, in which case Apple's rumored paid music streaming is considered more of a stepping stone to a bigger initiative where music is mostly free, but listeners obtain value from a breakthrough user interface (think: App Store, but for music). Over the next few months, many will position the music streaming battle between Apple and Spotify. Instead, Apple will be going up against free music streaming. The irony in this whole saga is that Apple's longer-term initiative may very well embrace free music streaming, but only when music artists and fans will be able to use software to monetize content beyond music sales. Apple is being forced into music streaming and the question remains if Apple can once again harness the music industry in a such way as to form a strong enough stepping stone to begin mapping where the music puck is headed.